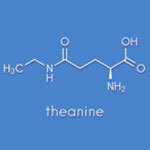 L-theanine is a relaxing amino acid found primarily in green tea. It induces relaxation without causing drowsiness and may help reduce stress, improve sleep, and boost concentration. Theanine affects various neurotransmitters in the brain, including serotonin, dopamine, and GABA, which regulate mood, alertness, and sleep as well as energy and other cognitive skills. It reduces the levels of chemicals in the brain linked to stress and anxiety, which helps counter the stimulating effect of the caffeine in tea. At the same time, it works with caffeine to promote concentration. The result? A calm alertness, without the jitters. L-theanine's effects on the brain may also be beneficial for people with mild cognitive impairment (MCI). In a study of 91 individuals with MCI, those given a green tea-theanine supplement combination showed improvements in memory and attention compared to subjects given a placebo. Researchers noted an increase in brain theta waves, an indicator of cognitive alertness, in people taking the green tea-theanine. By lowering stress and increasing relaxation, theanine can promote restful sleep. It may help you fall asleep more quickly and easily, and researchers report improved sleep quality, recovery from exhaustion, and refreshed feelings in individuals taking L-theanine. Evidence suggests that theanine may also improve sleep quality in children with attention deficit hyperactivity disorder. The antioxidant effects of L-theanine provide benefits to the cardiovascular system. Research finds that L-theanine promotes the production of nitric oxide, a compound that causes the blood vessels to dilate, in the linings of the arteries. This helps reduce blood pressure and decreases the risk for heart disease. L-theanine is found in tea leaves in low concentrations, so a supplement will ensure an effective dosage. L-theanine is generally safe and well tolerated, but it may interact with some medications, such as those for high blood pressure.